Last September when I posted Life Lessons From an Injury, I pretty much felt like the story was over. For those who haven’t read the latter, I would encourage you to do so to get the full scope of my message. In short, I tore the long head of my left biceps tendon out of my shoulder and didn’t have it surgically repaired. As I said, read the original for the details. One year post injury when I wrote my first blog, the pain in my left biceps was basically gone. I still felt a touch of discomfort in my front left shoulder, however I attributed it to the original injury and the fact that I was calling on the muscles in my shoulder area to function without the aid of my full biceps. Further, at that point, my right shoulder was “fine”. At least that’s what I thought. Later last fall right before the holidays, I was doing weighted chins and felt a sharp pain in my right front shoulder. Unlike my left arm, my biceps didn’t rupture but the pain in my shoulder was enough that I couldn’t do any more chins. If there’s one thing I hate, it’s when an out of the blue injury causes me to cut a workout short. Unfortunately, I had to back off significantly on the weights for my few remaining exercises and then called it a day. After a couple of weeks I was able to go back to chins however with less added weight and reduced overall volume of work. My shoulder was a little better however something was clearly wrong. Fast forward through the holidays and I never missed a workout continuing to train around the pain of the unknown injury. If you read my original post, you know that this same stubborn behavior led to my first injury. Rather than taking a break and going to the doctor, I plowed through the pain to the point that my shoulder and biceps said…enough! So shortly after the first of this year, I went to see Dr. William Burns, who specializes in Orthopaedic Surgery and Sports Medicine including shoulders and knees. He repaired my knee back in 2010 after a left Meniscus tear, and I trusted him to evaluate my shoulders. The basic ex-rays showed nothing so we moved forward with scheduling an MRI for both shoulders. With the pain in my left lingering, I thought it best to have it checked as well. Ever been in a “closed” MRI? My only suggestion is to go with “open” if possible. After an hour of being stuffed in that little hole, I was a bit frazzled. I’ve never really been challenged with claustrophobia, however with the combined “jack hammer” noise accompanying the extremely small space, I was relieved when the procedure was done. My day of reckoning to meet with Dr. Burns and view my film was Monday February the 8th. Leading up to the appointment, my emotions were all over the place. My gut said surgery and yet my heart was hoping like everything that my gut was wrong! Unfortunately my gut won out. With multiple tears in both left and right rotator cuffs, Dr. Burns said I’m basically a walking time bomb. 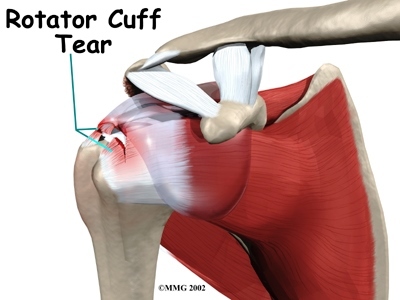 The reason my left shoulder still hurts is because of the damage to my rotator cuff. 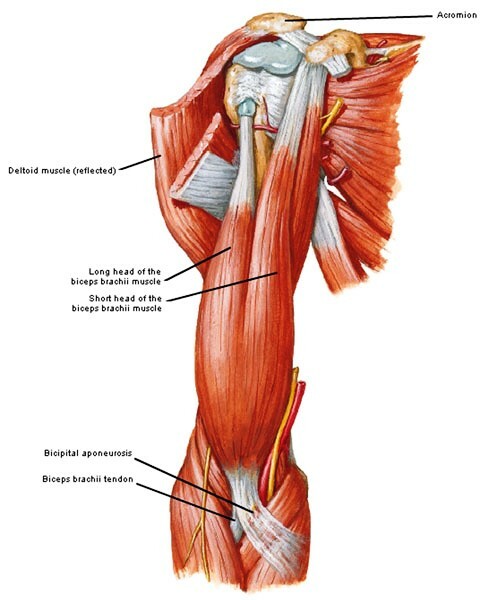 The reason my right shoulder hurts (and much worse) is because it has more damage and to magnify the situation, the long head of my right biceps is “fraying”. In short, it’s moving towards the same type of rupture that I experienced in my left arm. This was not the news I was hoping for. With my right shoulder clearly more at risk, we scheduled my first surgery for Friday March the 4th and 6:30AM. Once confirmed the emotional roller coaster ride began. Tuesday morning the day after my MRI viewing, I went to the gym and just did about 40 minutes of cardio. My mind was numb as to what I was facing and I didn’t feel like lifting. The timing of these events coincided with a business trip to East TX where I had roughly 4 hours of windshield time going and coming. Tuesday afternoon on my way back to Dallas the shock had worn off and I was trying to logically process how to best continue in every respect. For one I knew I needed to call my boss and let him know about my situation. Workrite Ergonomics is a great company and my boss Robert Cooper couldn’t have been more supportive. We discussed how to best proceed with my job and I committed to getting back in the field ASAP with as little downtime as possible. The second big decision for me was to start adjusting my training around not having my right arm. Dr. Burns said I would be in a sling for six weeks however he didn’t say I couldn’t train the other 75% of my body. While limited, there was never a doubt in my mind about whether I would still workout. The question would be how to train and select exercises that don’t involve my right arm. My focus has to shift to the goal of getting in a “training effect” rather than trying to perform based on my normal standards. My training routine will be a puzzle to solve in the days following my surgery and I trust that it will all work out. The odd thing is that roughly 90-120 days after my first surgery, I get to go back and repeat the process with my left shoulder. Fortunately I’m getting the hardest challenge out-of-the-way first because I’m right-handed. It’s been a daily revelation of sorts as I acknowledge all the “little things” I’ve taken for granted where I use both hands in general and or my right in a dominant capacity. Getting dressed in general and especially tying a tie and tucking in my shirt…not sure about that yet. All manner of cooking…and I cook most of my food…awkward at best. Texting while driving…just kidding…sort of. Oh well, now I can finally break the habit. Eating and drinking while driving…a natural requirement of being in outside sales…will be pretty much be impossible. Writing…do you remember learning to write in grade school? Can you say messy? Typing & especially using a mouse…and I actually type really well. Now it will be hunt and peck. Opening a bottle of my favorite condiment…Ketchup! What this verse means to me is that when faced with a negative situation, if the only silver lining is that I take away knowledge and experience to better serve and help someone else in the future going through the same or a similar struggle, then so be it. I still consider this to be a positive to hold on to and it can make all the difference in the world in dealing with life’s inevitable curve balls. I’ve been training now consistently for just over 33 years and as a veteran of the iron game, training with pain is just part of the deal. However, there is no reason to have any type of joint or acute muscle pain. And to train through this sort of pain is not only foolish but just asking for a serious injury. Please note that I’m as strong as ever having no loss in strength due to my injuries and yet I have torn rotator cuffs in both shoulders, a left ruptured biceps, and apparently a right biceps on the verge of rupture. I never would have guessed about the severity of my injuries based on my still high level of performance prior to viewing my MRI with Dr. Burns. If you’re experiencing persistent pain in a given area that is not simply post workout soreness, I highly encourage you to seek the help of a professional. I go back to my opening line, “You don’t know what you don’t know”. When it comes to your body, pain is a signal that something is wrong. Please don’t ignore pain and stubbornly work through it. It’s just not worth the potential risk. Stay tuned for updates following March 4th. This entry was posted in Health & Fitness, rotator cuff injury, shoulder injury, torn bicep tendon, Uncategorized, weight training and tagged #diet #health #fitness #wellness, rotator cuff injury, shoulder injury, torn bicep tendon. Bookmark the permalink. You’ll be in my prayers for a full and speedy recovery. Good luck and take care!